As promised in our last post about our unique “Split Lid” for 4-wheeled containers, here’s this month’s second piece of news which reflects ESE World’s position as experts and leaders in the world of sustainable waste management services and solutions. 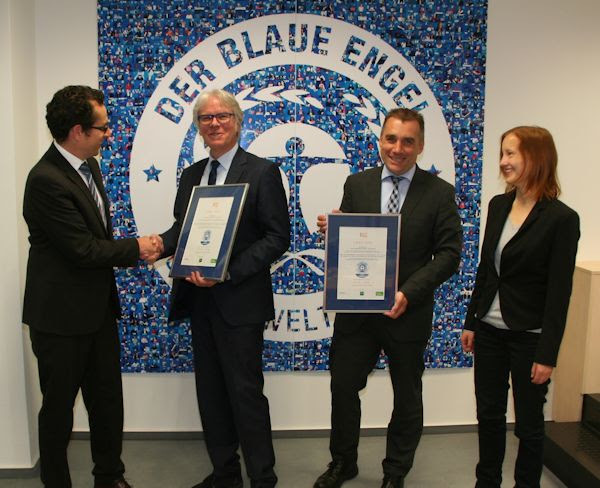 On 23rd of May 2016, ESE was awarded the internationally acknowledged ecolabel, The Blue Angel. The environmental standards mark is the only independent label – worldwide – used to measure the eco-friendliness of plastic bins for waste and recyclables. Intended for the protection of people and the environment, it sets very exacting standards and has proven itself, over more than 35 years, as a guide for selecting environmentally-friendly products. The bar for the award of The Blue Angel is set very high. The container has to be made from at least 80% Recycled Plastics and the material has to be certified according to EuCertPlast criteria – this means the origin of the material and the whole supply chain need to be traceable. Furthermore, the production site and processes have to be certified by an independent accredited institution. Thanks to the excellent teamwork of colleagues across multiple departments, we successfully installed the necessary processes and fulfilled all requirements. 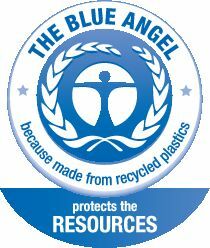 Given that new public procurement law (based on EU regulations) requires more sustainable procurement from the public sector and that The Blue Angel ecolabel is explicitly mentioned in relation to decision criterion, this achievement gives us a real edge over our competitors; ESE stands alone in being able to offer the mark for bins for waste and recyclables.